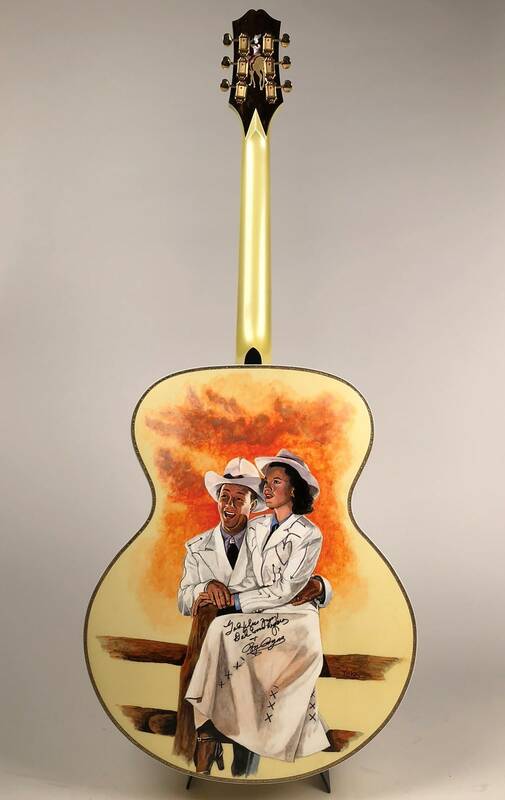 Guitars West is honored to offer this very special and truly one of a kind piece. 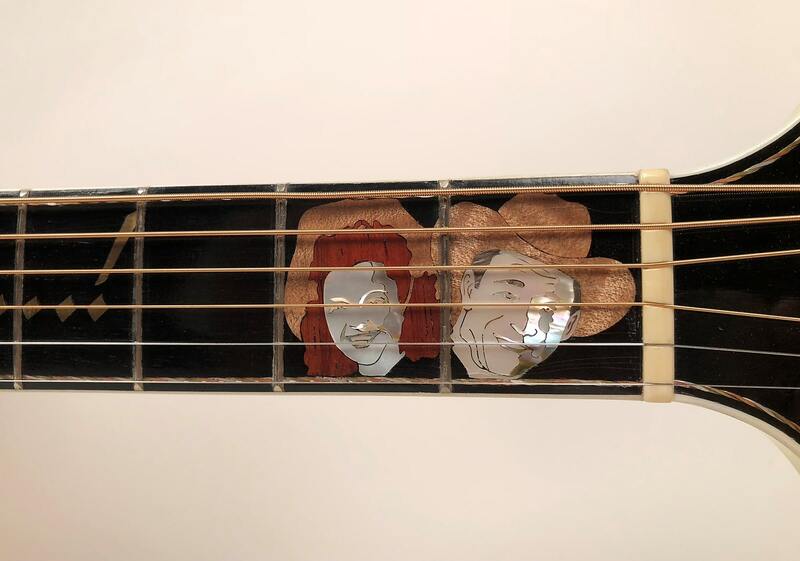 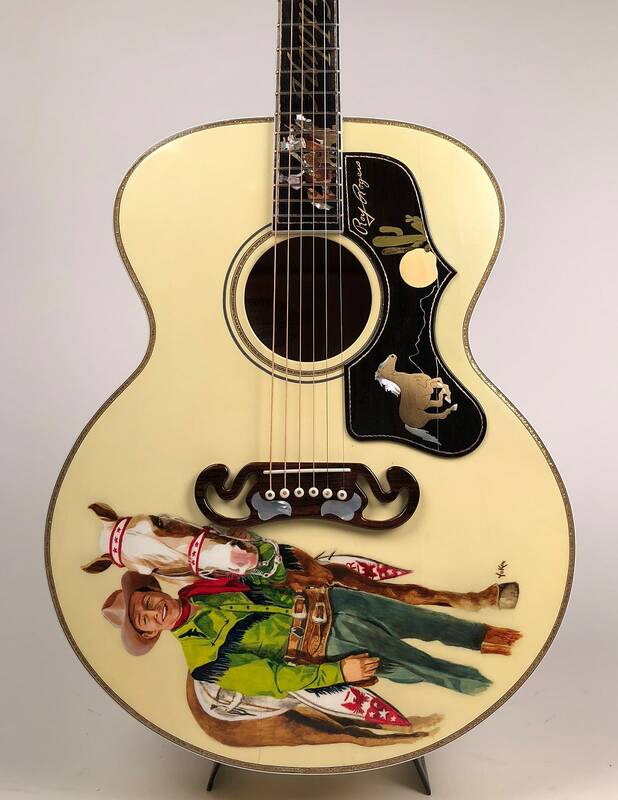 This is the prototype for Rich & Taylor’s very limited line of commemorative art guitars for their Roy Rogers “King of the Cowboys” series. 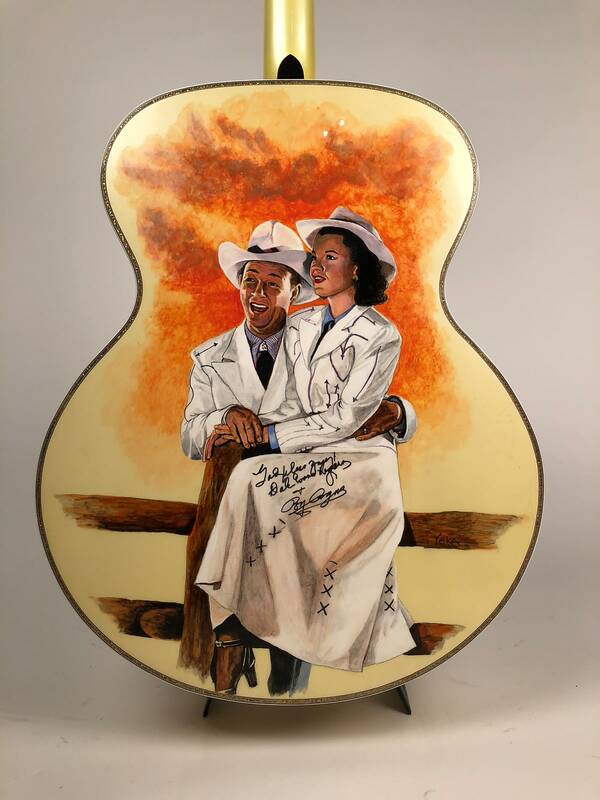 What you are looking at has been deemed one of the most valuable art guitars in history. 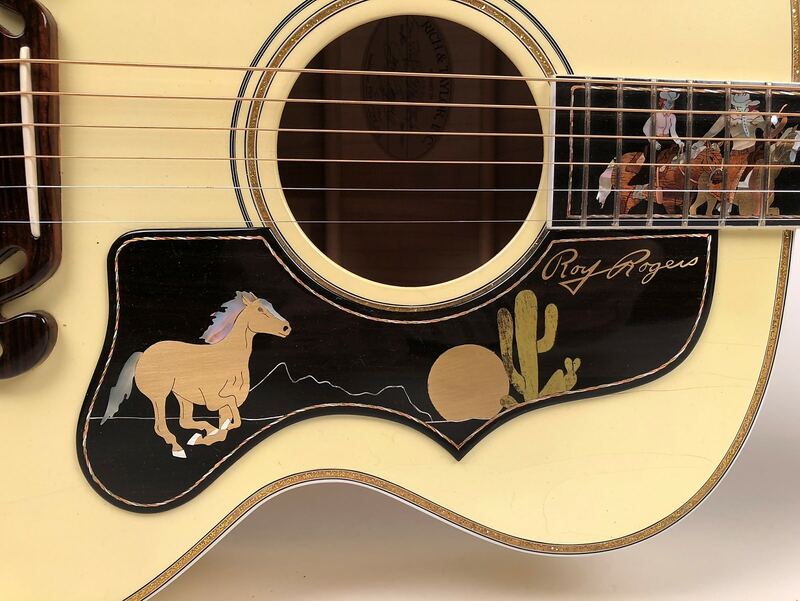 This beautiful piece is the prototype for the limited run of six guitars, and ours is the only one of which was signed by both Roy Rogers and Dale Evans. 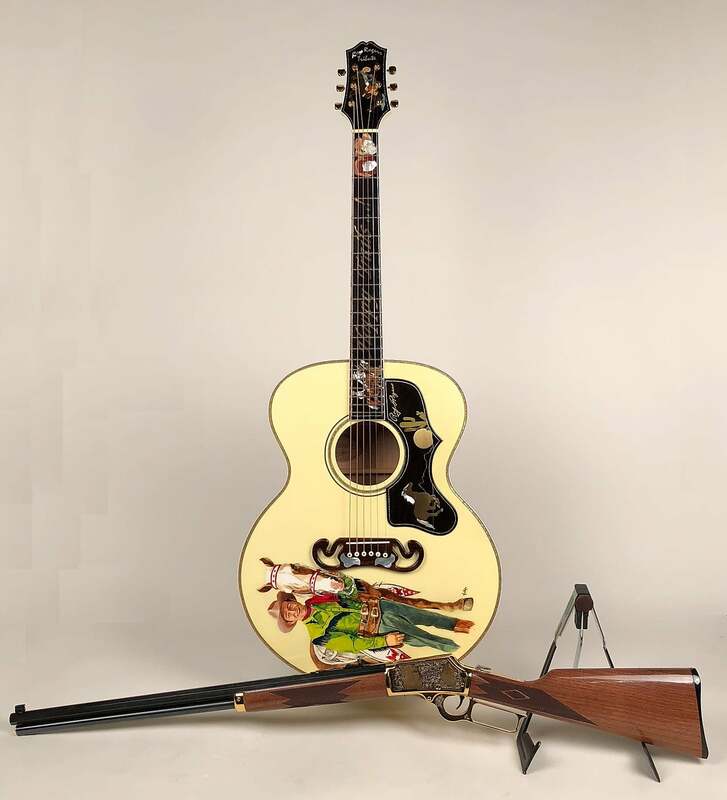 The guitar was constructed with as much quality, attention to detail and playability as, say, a Gibson J-200. 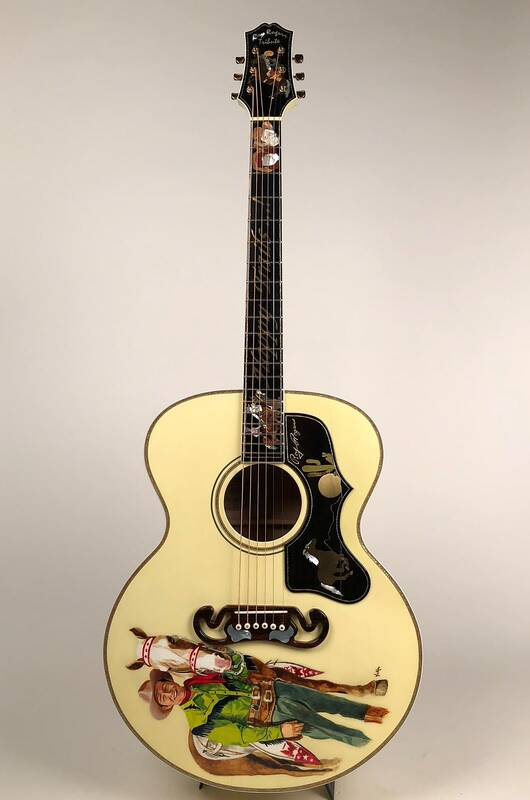 The guitar is finished with a soft metallic yellow nitro-cellulose with white and gold sparkle binding. 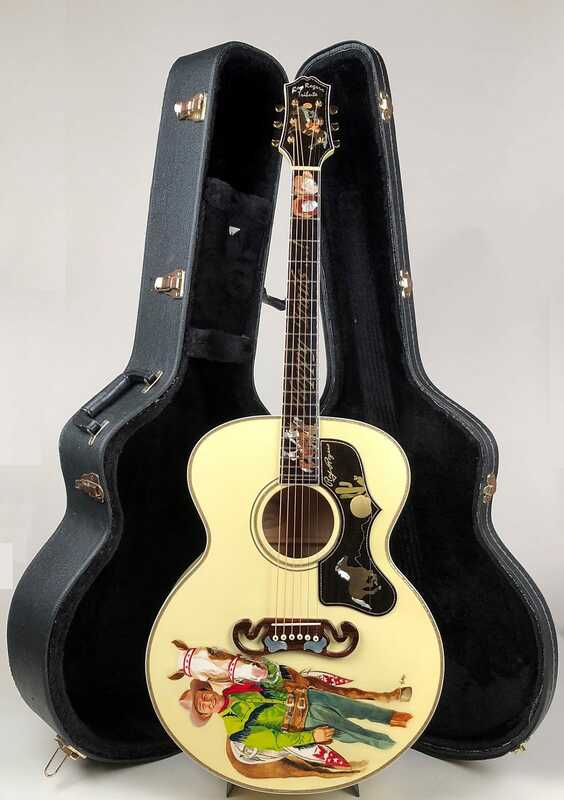 The lacquer itself is heavily checked but the guitar has remained in its case and properly stored in a private collection for its 21 years. 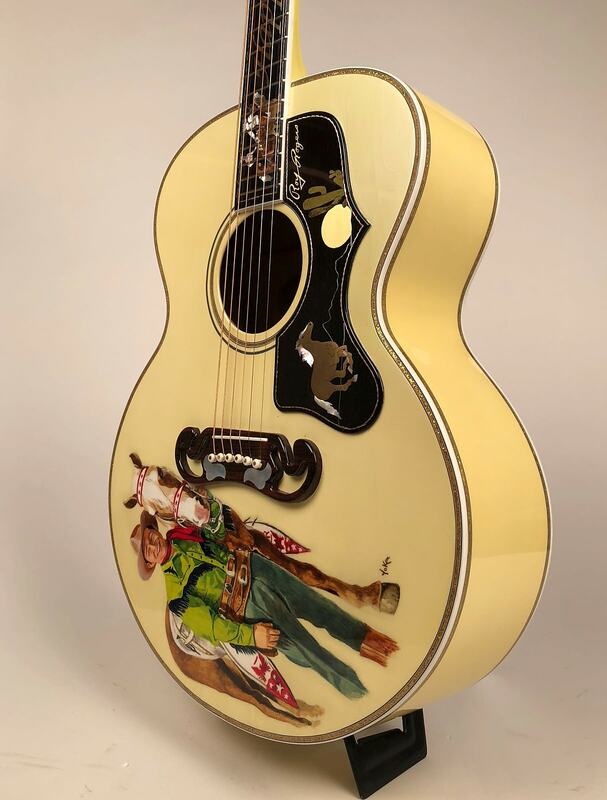 All the hand painted illustrations were done by the incredible Yoka Yohanna (Los Angeles, CA) and Greg Rich. 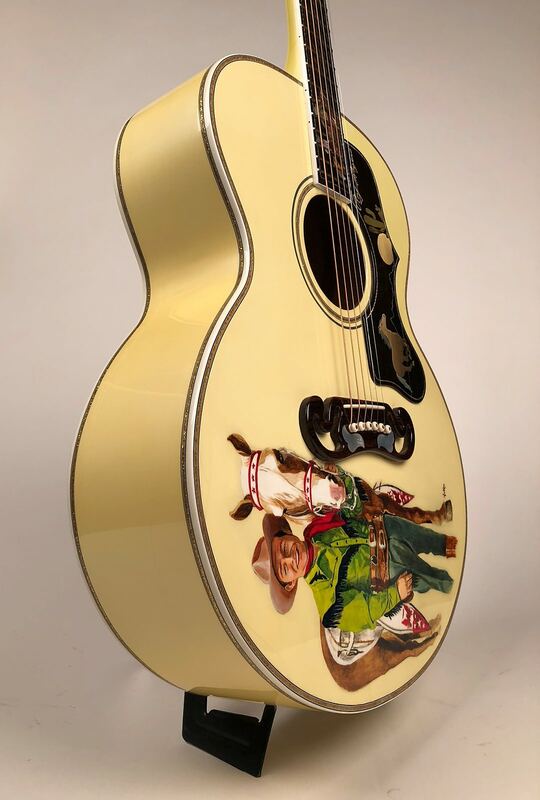 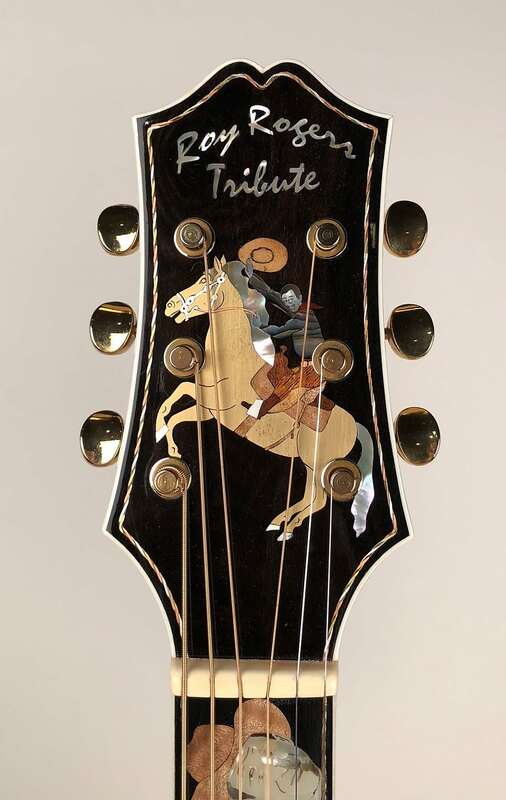 The guitar is adorned with several hand-carved inlays done in a variety of precious metals, all engraved by Rich who started his career as a metal engraver at Dobro and then Gibson Guitars. 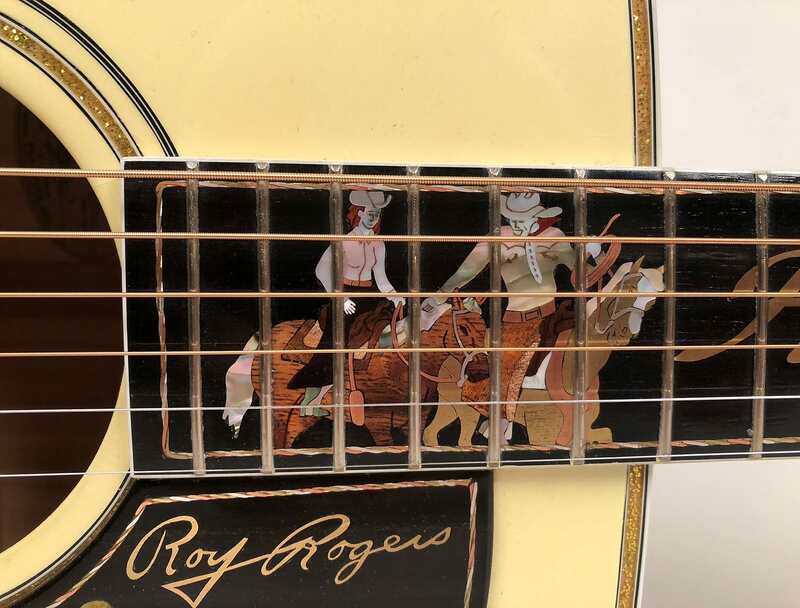 The label on the inside of the soundhole is signed by Roy Rogers himself. 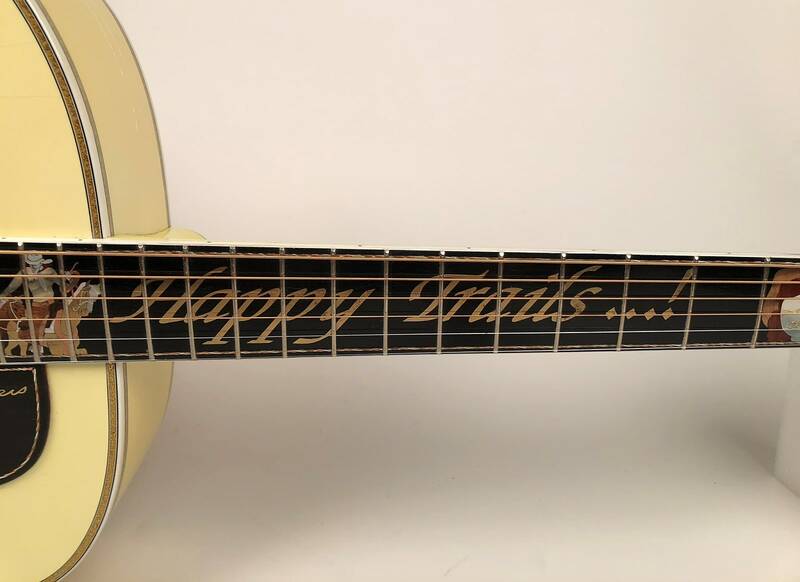 The guitar was crafted in late 1997. 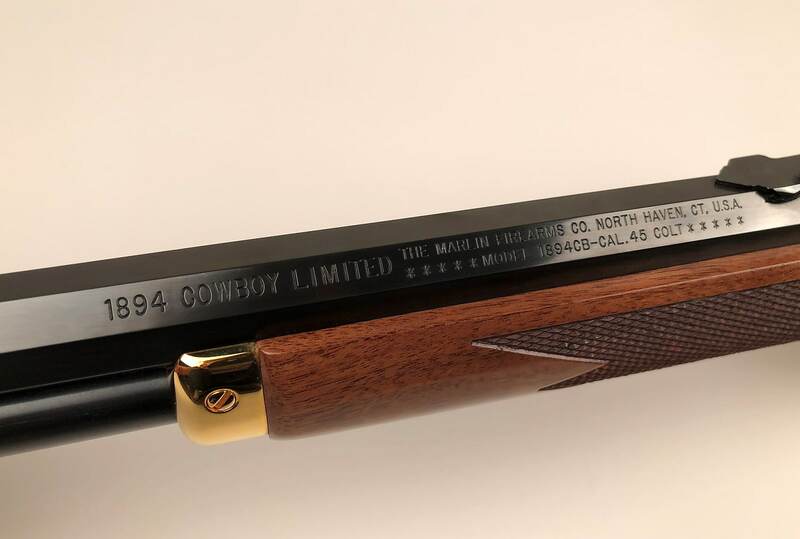 The line was officially launched in March of 1998 and was apart of a four page article in Cowboys & Indians May 1999 issue. 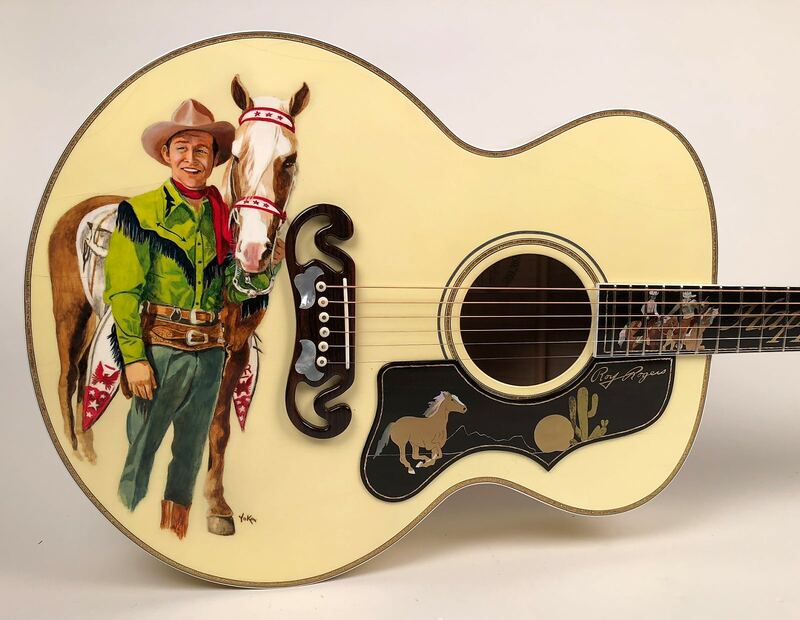 Included with the purchase of this very collectible guitar is the original hardshell case, the May 1999 issue of “Cowboys & Indians”, the letter of authenticity signed by Roy Rogers Jr. 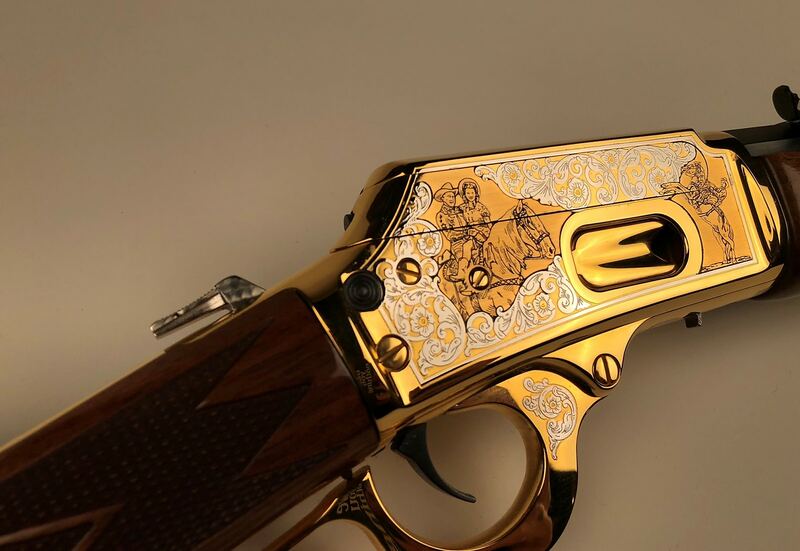 Included in this purchase is this beautifully decorated Model 1894 Marlin “Cowboy Limited” lever action rifle in caliber .45 LC. 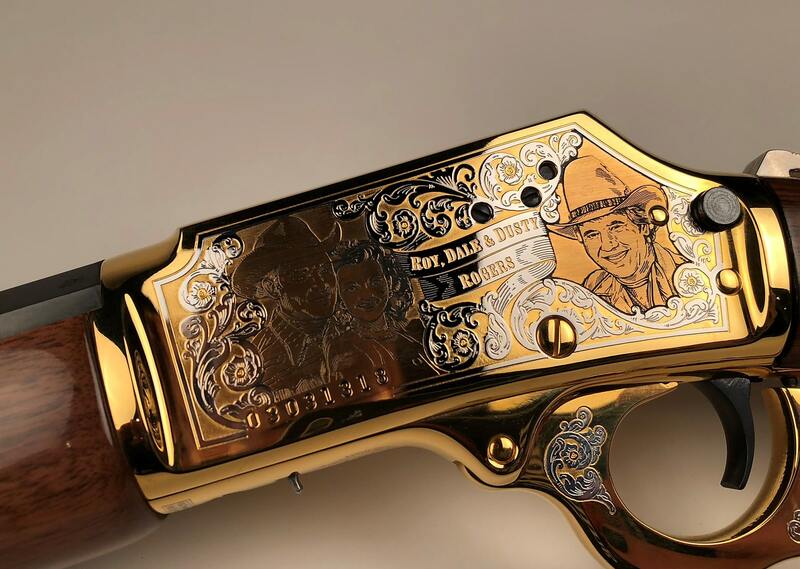 The left side of the receiver features a portrait of Roy “Dusty” Rogers Jr., Roy & Dale. 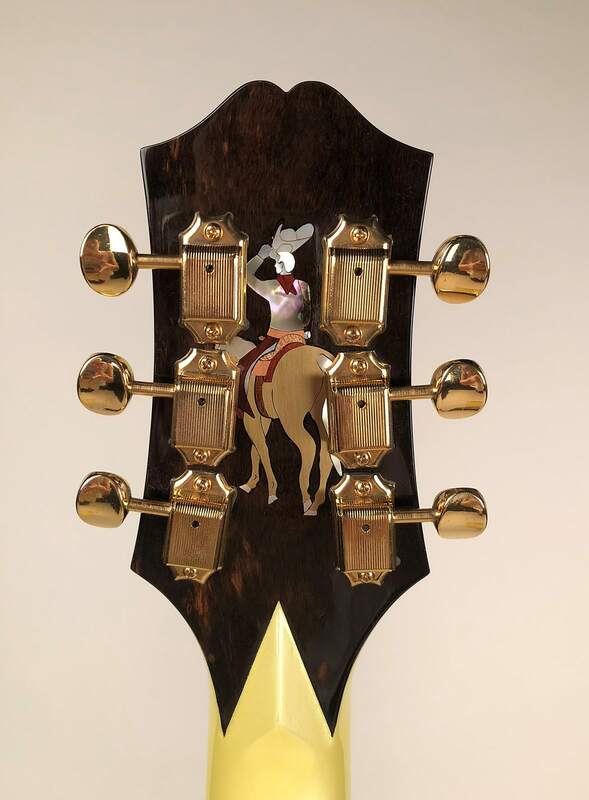 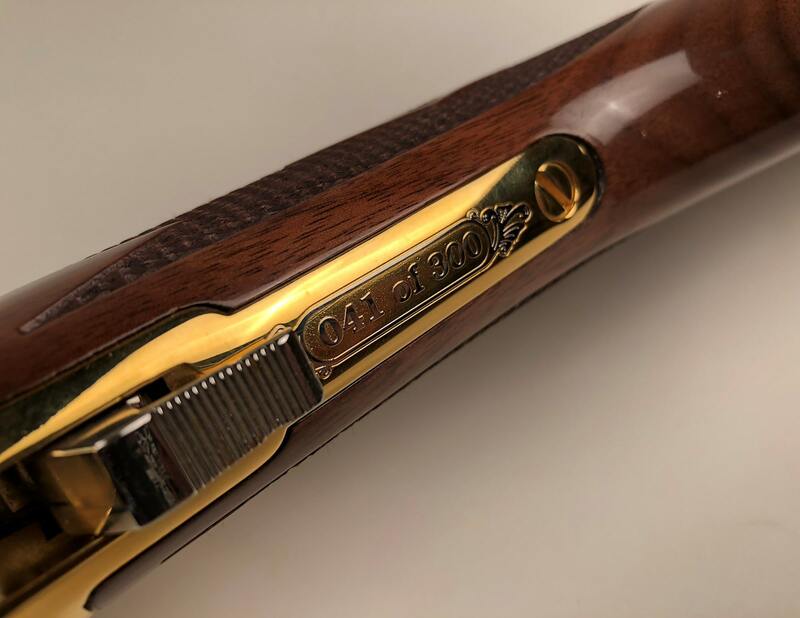 The right side of the receiver features the infamous Trigger, Roy’s horse and closest ally, rearing up. 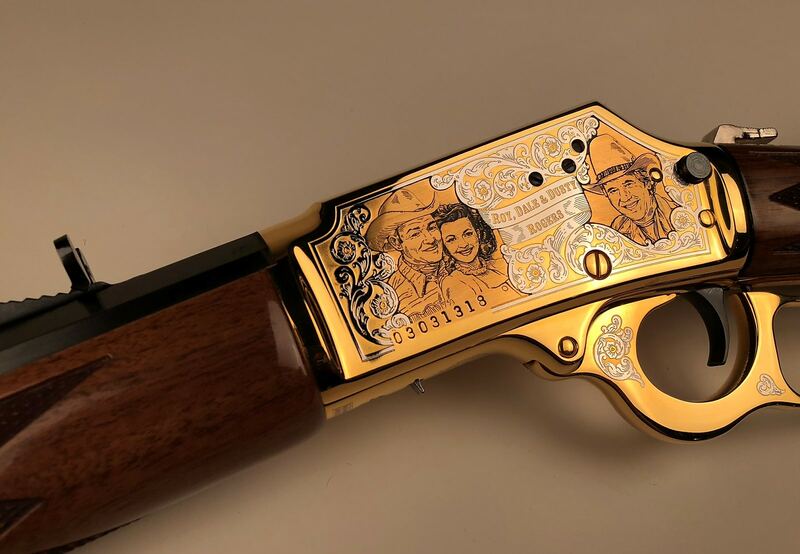 The rifle comes with ALL paperwork included by America Remembers. 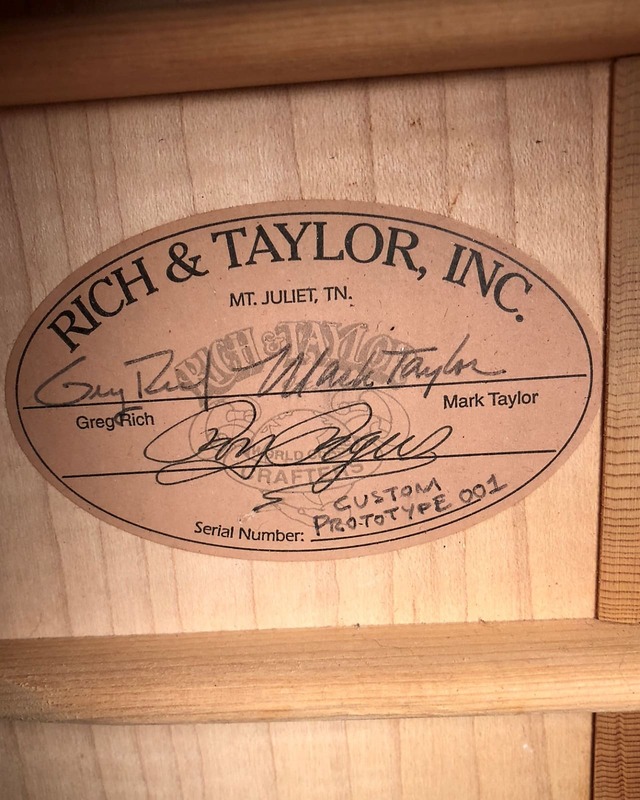 Please feel free to contact us with any inquiries or question you may have.